Anonymous asked: Really simple question here. Pitcher throws a ball. Batter still hits it to the outfield. Does it count as a homer? 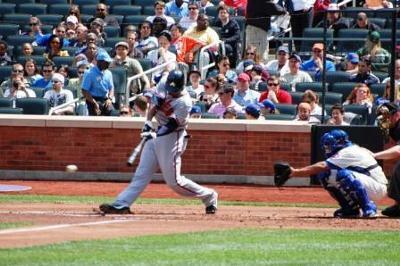 It makes no difference if the pitch that is hit is a ball, or a strike, for it to be legally hit by a batter. Whether it is a homerun or not would be determined by how the situation plays out. If it carries over the fence and inside the foul lines of the field, it would be a home run. If it drops inside the fence, but also in fair territory, the option for a homerun becomes a matter of the batter/runners foot speed and the slowness or quickness of the outfielders in question at the time. If the batter/runner is fast enough to touch all 4 bases before the defense is able to get to the ball, return it to the infield to either keep the runner from touching home, or tag him out before he can do so, it would be an inside the park homerun.